Starting this week, utility work and other construction activity will eliminate some parking spaces along First Street. The utility work is just the latest piece of a project that has been underway since late 2015. 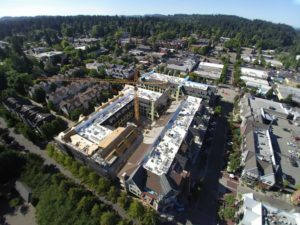 When it is completed, the mixed-use development will include 200 residential units, almost 43,000 square feet of commercial space and parking for 430 cars, of which 135 spaces will be for public parking. Since construction began, The Review has been using drone photography to produce a visual record of the Wizer Block’s transformation from 1950s-era shopping center to a mixed-use development with homes, offices and shops. These images were taken July 28 [watch here, “Pamplin Media July 2017”]. The Review will return monthly to the Wizer Block to record the project’s progress. Watch for the images on facebook.com/LakeOswegoReview, at lakeoswegoreview.com and in the pages of the newspaper.